The Red Bull Cliff dive series is a worldwide competition that pits the best high divers in the world against one another. The professional divers jump from heights of 26–28 m (85–92 ft). That is HIGH, it’s one of the most amazing things to watch due to the spectacular spins, turns and of course heights. 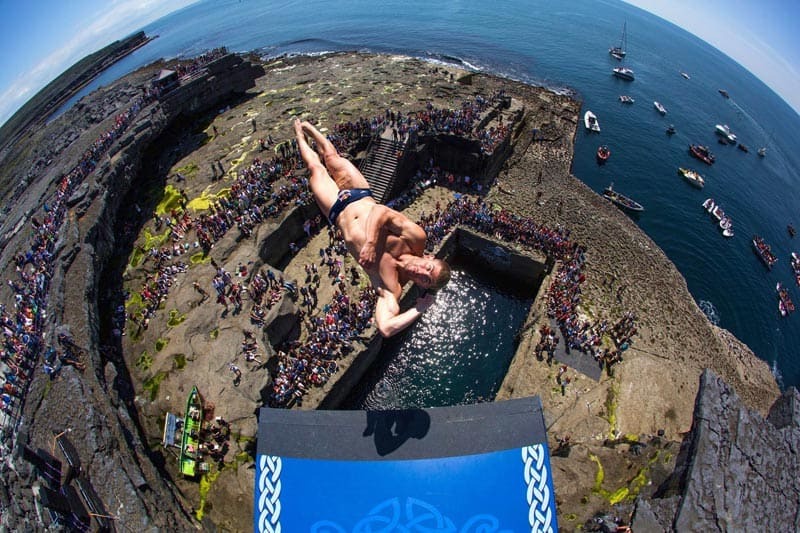 Below is Red Bulls 10 biggest cliff dives from around the world. One of the most spectacular dive spots in this video is over on the West Coast of Ireland. The legendary “Serpents lair”, a place steeped in folklore, ancient stories and myth. It is a unique Blowhole but unlike the many blowholes up and down the west coast of Ireland and Scotland, is the Serpents unique shape. The Serpents lair is an almost perfect rectangle and at first glimpse, you will almost automatically believe it was man made. However, it is, in fact, all natural. Here is a video of the Serpents lair section of the Red Bulls high dive tour. Do you want to try Cliff Jumping? Now Cliff diving at the RedBull heights is only for the professional athletes but here at Splash, we are masters of commercial Canyoning and George Walking adventures. We have a number of canyons that we work and can give you the thrill and excitement of the Redbull cliff dives but in a more manageable package. Cliff jumping/cliff dives into natural deep pools, swimming down rivers, slipping and sliding through this amazing activity. Our keltneyburn site offers jumps from 5 to 25ft, this is not 95ft but when your up at 20 plus foot you will notice the height and the adrenaline will flow. This is guaranteed!! Here is one of our Keltneyburn videos, this will give you a feel for what we do.